Modern urban fantasy is the thing these days, and it permeates all genres of fiction. Vampires, werewolves, and ickier things that go bump in the night are everywhere you look. If I had a brain, I’d jump on the bandwagon with Charlaine Harris, and Janice Davidson, and Emma Bull, and Charles de Lint, and Jim Butcher, and Larry Correia. They are all terrific writers, and I’ve even met a couple of them, which convinces me that they are also terrific people. Maybe I should get over to the Poisoned Pen book store in Scottsdale tomorrow night and meet Larry, too. Coincidence that I decide to write this review and then find out he’s in Phoenix this week? Raise your hand if you believe in coincidences. My copy of MONSTER HUNTER INTERNATIONAL is pretty beaten up. I would like to add it to the Phoenix Public Library collection–a fate that befalls many of the books that come my way, but I have just used it too hard. We don’t add books that have creased spines, stained edges, and a front cover that is curling back on itself. It’s not about content in the library–these days it’s all about looking good. That’s what happens to a 700 page book when it gets read. It takes a while to finish it. In the process the book gets handled, opened, dropped, folded, mutilated and it winds up looking like its hero–a big tough ugly galoot. So, I was going to donate it to the Friends (of the Century Branch Library)–some other fantasy reader would find it in the book sale corner and enjoy it, maybe as much as I enjoyed it. Then I thought, what the heck? I liked the book a lot. Let’s write a review before giving it away. Owen Z. Pitt begins his career as a monster hunter by getting attacked by a werewolf. Unlike most people who get attacked by werewolves, he doesn’t die. In fact he manages to kill the thing before succumbing to his own wounds. Ordinary people die, but heroes have a way of surviving when ordinary people die, and make no mistake, Owen is destined to be an epic hero. For one thing, he’s a goon. Six foot ten, four hundred pounds of bone and muscle, smart–Owen walks around with a .357 magnum concealed on his person–even when he’s going to his day job as an accountant. Something about being a goon is a big help in also being a hero. Would you believe that all those monsters that you don’t believe in do really exist? Would you believe that they are causisng havoc all over the world, and that there are both government agencies and private corporations dedicated to fighting and killing them? Of course you would. You believe in aliens and the Men in Black, don’t you? After he recovers from being mauled by a werewolf, Owen gets recruited by Monster Hunters International (and also by an old Jewish ghost of a monster killer from a previous generation). The allure of fighting monsters for fun and bounties might have been enough to sign him up, but he also meets Julie Shackleford, a beautiful gun-toting Amazon. Throw in the prospect of true love, and his fate is pre-ordained. (Turns out that is truer than I thought when I coined the phrase–must be nice to be born the Chosen One of Prophecy!) Before he knows it Owen is fighting for his life against vampires, gargoyles, wraiths and other-dimensional horrors. He meets elves, orcs, and ghostly guardians. He winds up trying to save the world from the Cursed One and the Old Ones who come from another plane of existence. Neither H.P. Lovecraft nor Yog-Sothoth is mentioned by name, but you know this book falls right into the Mythos tradition. H.P. Lovecraft and Robert E. Howard were penpals. MHI is Lovecraftian horror as written by Conan’s scribe, with a touch of Bram Stoker thrown in. Vampires really are the in thing in modern fantasy! What I really liked about Monster Hunter was the fight scenes. Correia, who according to the biographical note in the back of the book is a real-life gun nut and combat instructor writes the best battle scenes since Howard died. He takes you into the whirlwind of battle, and while you are reading those scenes, it’s almost like an out-of-body experience. You, the reader, will feel that heart-pounding excitement that only comes during the most intense combat or sports experience. If you’ve never actually been in a fight that mattered, you won’t know what I’m talking about–how the world narrows down to the next swing of your fist, or pull on the trigger. Or maybe you do, if you’re the kind of person who goes to action thrillers and loses yourself in the over-the-top combat scenes the movies can produce these days. 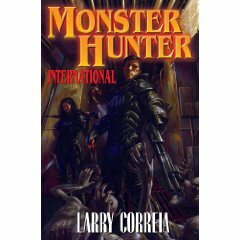 But, read MONSTER HUNTER INTERNATIONAL and you will get some idea what those experiences are like. It’s a hell of a tale, and if Correia can keep writing like this, he may become the Robert E. Howard of the 21st century. A challenge came my way today to write a poem about clouds. This is what came out. I tried to post it to Facebook, but FB lost the formatting, so I’m putting it here instead. They take so many shapes. The same spot in the sky. And just go zipping by. Clouds can make me gloomy. They always make me glad. Last Saturday was a busy day for me–an expensive day, but a good day. It started with me going to Uhaul and renting a pickup truck, The truck was a beauty, and a pure pleasure to drive–just being in it took me back mentally 40 years to the days when I drove light trucks and did delivery work. I drove to Avondale, picked up an exercise machine, took it home, turned the truck back in. It cost me about $70, but I got an exercise machine, and I’m starting to work out. (very, very lightly–I am so horribly out of shape.) You know how some people like to run, or work out? Well, I like to drive, especially in a really nice vehicle. That Uhaul truck was fine–had less than 5000 miles on it. But, I’m not talking about wheel alignment–just trying to give you some idea of how busy my day was. I have been talking to a man named Richard Porter for a couple months now. Richard is a computer security expert, and a Tunnels and Trolls fan. About 11 a.m. he came over to see me. We had computer issues to explore. He brought his wife, Wendy, and beautiful daughter, Kate. We did lunch at the California Pizza Kitchen–yum–that’s upscale for me, downscale for him. The food is good. Thank you, Richard, for buying me lunch. After lunch, we were talking about how Trollhalla (trollhalla.com) needs a wizard to help manage the site. He volunteered. Trollhalla is a site that provides services to its members, and it’s full of links and databases that need constant supervision. I was stressing the fact that any wizard had to be totally reliable. Wendy supported her husband by saying he was definitely Lawful Good. (We’re all gamers–we know what that means.) That started a mini-discussion about what alignments the rest of us fell into. Richard tried to claim that Wendy was Chaotic Good, but she denied it. She asserted that her alignment was Female. It seemed to fit. We (and that’s the royal We) have encountered characters of that alignment before. The normal adjectives do not seem to apply to the Female Alignment. Good, Neutral, Evil–most Females pass through all those phases every day. The most plausible modifier for the Female alignment seems to be Variable. Other qualifiers that could be applied: Moody, Loving, Beautiful, Witchy, Snarky–in fact the list is as infinite as the behavior of the female of the species. Female is, of course, the most dangerous alignment of all. November is National Novel Writing Month–NaNoWriMo. In 2007 I particpated in the novel-writing frenzy, and I produced Griffin Feathers. Check it out on Amazon.com. I’m really proud of it. This year I’m doing it again. My working title is simply Rose, and my main character is someone who’s an idealized version of someone very special to me. It will be a Tunnels and Trolls novel, and there are good reasons for that. I know Trollworld. I made it, with a lot of help from my friends. I know where the monsters live, and I know how, and I know why. I know where strange things can pop up. And they will pop up–what’s the fun of creating a new story if you don’t put new things into it? And, it has to be a fantasy. I obsess over fantasy. Trapped in a world of relentless science, I crave fantasy–wizards, monsters, and magic. Here on 21st century Earth I can have a fantasy of fantasy, but not the real thing. Law and Science rule our world. Those who think otherwise delude themselves. I prepared myself for this literary sprint. I made a long drive out to Tempe, Arizona last month to attend a free talk about writing fast and writing well given by my friend Michael Stackpole. Michael is an enormously prolific author. He’s smart, and he’s good, and it burns my soul that I haven’t accomplished what he’s accomplished as a writer. It’s not that I haven’t heard his advice before. It’s more like I need to hear it again. Mike told me, and 30 other would-be writers, to let the characters drive the story. That’s one of my goals this month. Spend more time on character. That’s hard. It’s especially hard if you try to avoid caricature. I don’t want the reader to say, oh, he’s a typical fighting dwarf. So, I’ve changed that character to a fighting dwarf female. And she’s getting kind of old, grumpy, and forgetful. How will that affect my story? I don’t know. Another thing Mike told me is don’t go back and revise until you’re done. Your goal is 1700 words a day. If you spend much time editing yourself as you go–and that is something I normally do–you won’t get your 1700 words done. Fix it later. Make notes. Change things later. Elaborate later if you have to. But don’t stop. Don’t go back. Let the words flow and devil take the editing. That’s hard. A third thing he mentioned was to print out what you’ve written every day and put it in a binder. I work on a computer–in a sense I’m online whenever I’m on a computer, and when you’re online you can be interrupted. Print it out. When you want to edit, edit offline. Mark up your manuscript. When November is over I can go back and use that marked up draft to improve my computer files version of the novel. I have 8 pages printed out so far, and even though I know they’re full of errors, they look good to me. I can hardly wait to have 40 or 100 pages printed out. I’m off to a good start. I’ve done two chapters, about 3100 words in the first two days. I’m barely starting to introduce my characters and my world. Two days down, twenty-eight to go. Wish me will power. Egg me on! Challenge me to finish. I have challenged myself this year by telling everyone I’m going to do this thing. I’ll feel pretty stupid if I don’t do it. But you guys can also crack the whip. God keep me from distractions until I’ve done my 1500 words or more per day. And, if you’re also writing for NaNoWriMo, then take this as encouragement. I’m really a very lazy guy. If I can do it, you can do it. Let’s encourage each other, and see who has the longer, stronger, better manuscript when the month is over.